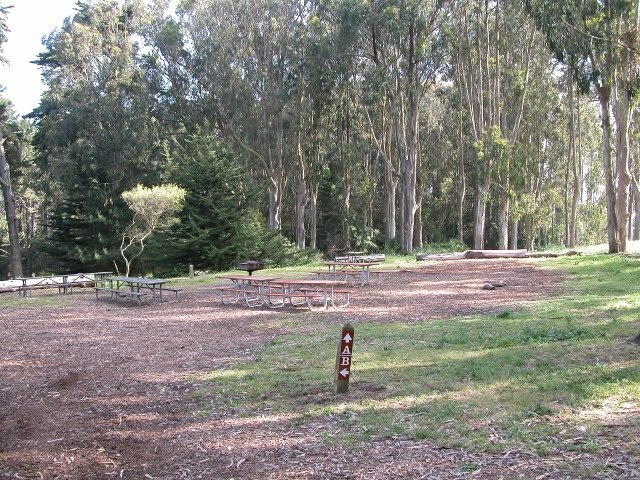 The Presidio's (and city's) only campground has just reopened after extensive renovations. When I visited Rob Hill Campground 2 years ago, it looked like this -- a bare-bones blank spot with no frills and icky amenities. I hope to get back soon for an in-person look at the changes; in the meantime read about the updates here. The campground is in the western part of the Presidio, on a wooded hill not far from Baker Beach. It's hardly remote (you can see and hear nearby Washington Boulevard), but the campground offers city kids the opportunity to sleep under the stars (or fog). Before you rush out with your tent in hand, note that Rob Hill is a group campsite, only available by advance reservation (Presidio Trust Special Events Office at 415-561-5444). I want to go check it out soon too. Though, I'm not expecting much. From what I read, the improvements include being handicap accessible and a new fire circle. I'm happy to see that it is accessible to the handicap now, but I would expect much more for $4M.